PREFACE Hydrogeology is now considered to be a core course in the curriculum of undergraduate geology programs as well as many fields of engineering. There is ongoing demand for persons with training in hydrogeology by consulting organizations, state and federal regulatory agencies, and industrial firms. Most of the employment in hydrogeology is in the environmental area. This is a book that will help prepare students for either a career in hydrogeology or in other areas of environmental science and engineering where a strong background in hydrogeology is needed. 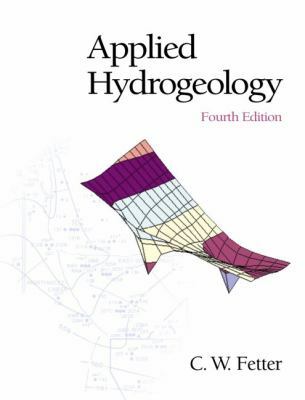 Applied Hydrogeologyis intended as a textbook for an introductory course in hydrogeology taught either at the advanced undergraduate level, or as a dual-level undergraduate/graduate course. It is also useful in helping individuals who are preparing to take state examinations for professional registration as a hydrologist or hydrogeologist. It can be found as a reference book in the personal library of many working professionals. The reader is expected to have a working knowledge of college algebra, and calculus is helpful, but not necessary, for practical understanding of the material. A background in college chemistry is necessary to understand the chapter on water chemistry. The book stresses the application of mathematics to problem-solving rather than the derivation of theory. To this end you will find many example problems with step-by-step solutions. Case studies in many chapters enhance understanding of the occurrence and movement of ground water in a variety of geological settings. A glossary of hydrogeological terms makes this book a valuable reference. The fourth edition contains new case studies and end-of-chapter problems. In most cases the problems are paired. An odd-numbered problem will have the answer given in a section in the back of the book, followed by an even-numbered problem without the answer. Step-by-step solutions to the odd-numbered problems can also be found at theApplied Hydrogeologyweb page: http://www.appliedhydrogeology.com. Many chapters in the fourth edition also contain a section called Analysis, with non-numerical questions. The use of spreadsheet programs, such as Microsoft Excel, in hydrogeology is introduced here. Included with the text are working student versions of three computer programs that are used by ground-water professionals. They have been furnished free of charge by the software publishers. No technical support is furnished for these programs, either by the author or the software publisher. However, they are easy to use and come with tutorials and documentation on the CD-ROM. The following reviewers provided helpful suggestions for the fourth edition: Gary S. Johnson, University of Idaho; Larry Murdoch, Clemson University; Claude Epstein, Richard Stockton College of New Jersey; David L. Brown, California State University at Chico; F. Edwin Harvey, University of Nebraska at Lincoln; Edward L. Shuster, Rensselaer Polytechnic Institute; Willis D. Weight, Montana Tech. of the University of Montana; Larry D. McKay, University of Tennessee at Knoxville; Laura L. Sanders, Northwestern Illinois University; Jean Hoff, St. Cloud State University; and Jim Butler, Kansas Geological Survey. I am grateful to Larry Murdoch and Rex Hodges of Clemson University for introducing me to the use of spreadsheet ground-water flow models. I would especially like to thank Glenn Duffield of Hydrosolve, Inc. for furnishing the student version of AQTESOLV, Pat Delaney of Waterloo Hydrogeologic Inc. for furnishing the student version of Visual MODFLOW and Kirk Hemker for the use of FLOWNETLT. Todd Rayne of Hamilton College has prepared the solution manual for the problems, which course instructors can request from their Prentice Hall sales representative. Patrick Lynch, Senior Editor for Geology at Prentice Hall, has been very supportive through the course of myFetter, C. W. is the author of 'Applied Hydrogeology', published 2000 under ISBN 9780130882394 and ISBN 0130882399. Loading marketplace prices 141 copies from $16.97 How does the rental process work?